This weekend, one of the county’s smallest communities will come together to clean up, take stock and celebrate nearly 50 years of growth and change since its incorporation in 1964. A series of activities, services and events Saturday and Sunday will aim to draw Blue River residents together to spruce up the town and develop a vision for its next 50 years. The weekend will include a number of town-sponsored services as well as a barbecue and community party on Sunday, during which residents will be invited to weigh in on a comprehensive plan that will help define the future of the community. Sunday’s party, from 11 a.m. to 4 p.m. at the town hall building, will be the headline event of two days packed with community activities. The weekend kicks off Saturday with a town yard sale and donation-collection effort. Habitat for Humanity will be at the town hall building accepting donations of furniture and other household items. There will also be Dumpsters out in the same location for those looking to clear out garbage. The town will also have officials available to do radon and well-water testing and to provide information on the proposed bike path through Blue River. Red, White and Blue firefighters will also be on hand to do safety, “firewise” and defensible-space home inspections. Blue River officials received a grant to remove branches and debris around town this weekend as well. A chipping company will be collecting unwanted debris on Saturday, but residents need to pile items to be cleared away at the curb. Sunday’s festivities will include some of the same services but will focus on bringing the community together. A party at the town hall will include bounce houses and face painting for children, along with corn hole, hamburgers and hot dogs. Residents are encouraged to bring a side dish to share. Consultants from a company hired to lead the comprehensive planning effort will attend the event to discuss the town’s future with residents. Which is what the town has dubbed the weekend of activities and events. “The Next 50” weekend is open only to residents of Blue River. The town hits the big five-oh in 2014. Town officials hope the comprehensive plan, a process of determining the community’s goals for future development, will be completed later this year. 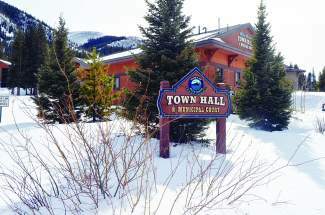 It will likely confront some of Blue River’s biggest questions: whether to allow commercial business operations in the town limits, how to address backcountry access and a possible three-mile plan examining how the town will interact with its neighbors in the years to come. The project has far-reaching goals, but there are some things town officials say are not on the table for discussion.